When William Joyce first presented his concept to our small team, Jack Frost was already a full fledged Guardian of Childhood, right alongside Santa (North), Tooth Fairy, Easter Bunny, and Sandman. 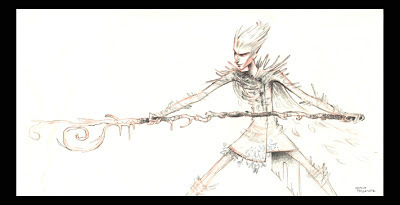 Jack Frost was also presented as an adult man, clad in a musketeer meets Edward Scissorhands style outfit, complete with a broad brimmed hat and an elegant wooden staff. As we started to brainstorm and discuss all of the characters and a potential story for all of them to live in, it QUICKLY became clear that Jack Frost just seemed out of place and out of his league amongst these other superstars of childhood mythology. 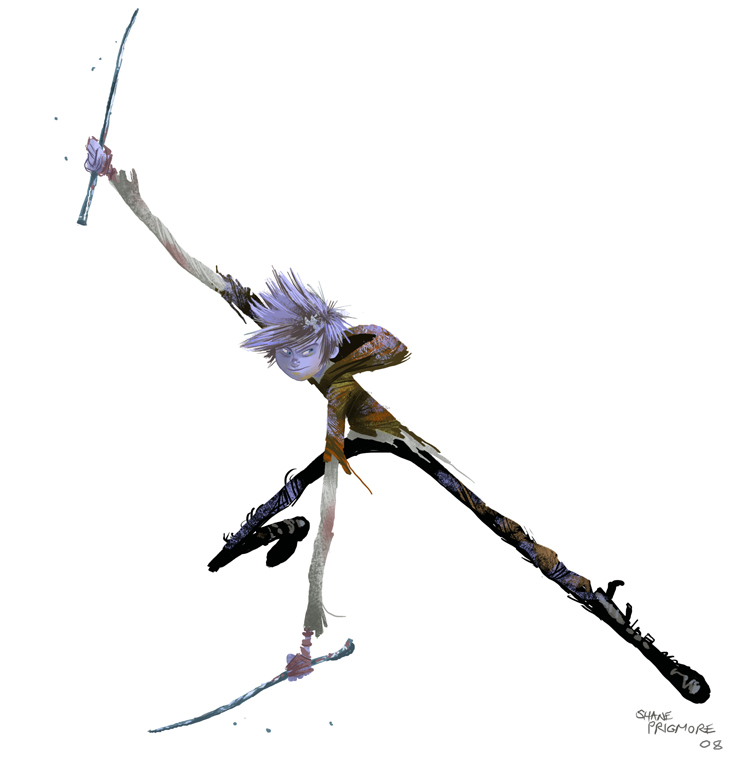 What did Jack Frost do to earn his position as a Guardian, and what does he really do for Children anyway? So we all thought out loud “What if North, Tooth, Bunny, and Sand Man all felt the same way about Jack Frost that we do?" Maybe Jack is NOT a Guardian. What if Jack was just a neutral outsider living his own life wanting nothing to do with the Guardians or Pitch at all? What if Jack had to earn the title of “Guardian” if at all? What if THAT was our story? Jack could be our main character! We were all very excited about this angle, and it was during this time that I proposed the idea that Jack Frost might be even more of an outsider if we made him a younger character. “What if Jack was a kid amongst these adult Guardians?" And being a kid, what if he naturally understood kids…even more than the adult Guardians? From the beginning we knew that what was going to be at stake in our story was the children of the world. Children is what Pitch “the Boogey Man” needs to make himself more powerful (feeding off their fear). Children are what the Guardians are here to protect. Children are why the Guardians exist. So this became even more of a case to make Jack, the potential key to our story, a kid himself. Here is just a small sample of my extensive development work on Jack Frost for Dreamworks RISE of the GUARDIANS: -(Below are a couple examples of my earliest exploration of Jack Frost(beggining of 2008). I treated him as a younger character, but his costume here is directly inspired by William Joyce’s initial illustrations. -Below is a very early color piece of Jack exploring a more casual but still supernatural costume, he also has a more free, fun loving attitude. 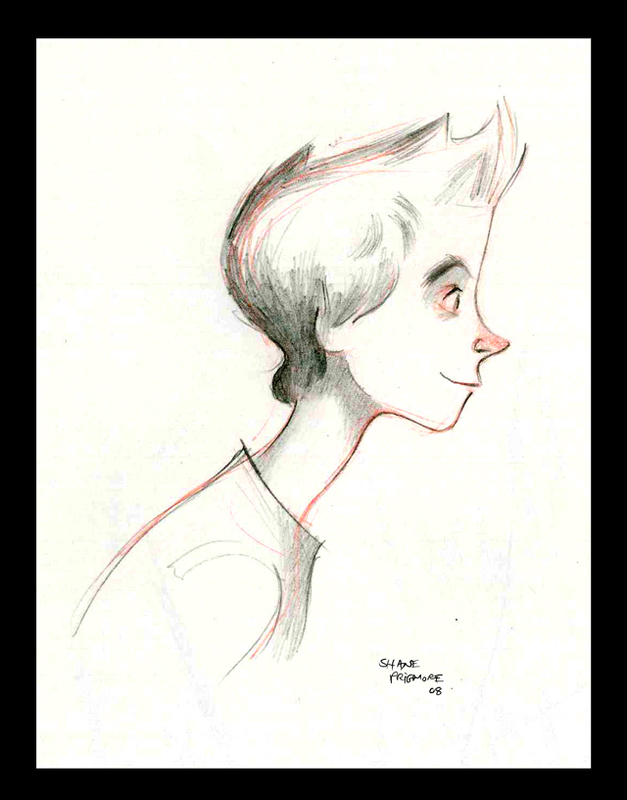 His character was starting to take shape, but his design still had a long journey ahead. 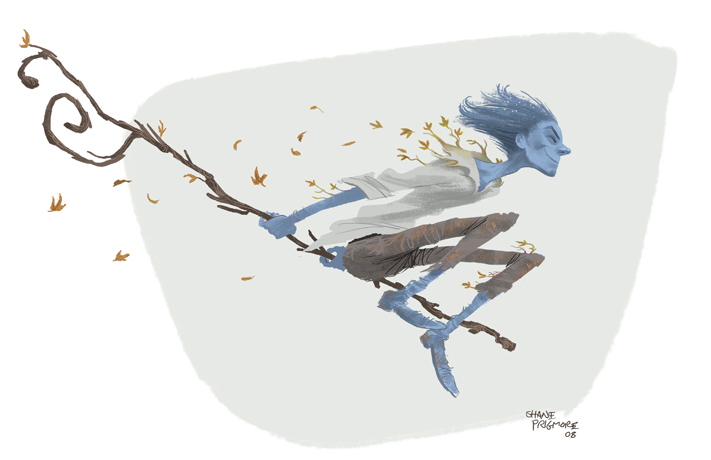 -An early, rough beat image to suggest that a younger Jack Frost would hang out with kids (but not be seen). -Now how young could we go with Jack? Below are a couple exploratory designs of a much younger Frost. 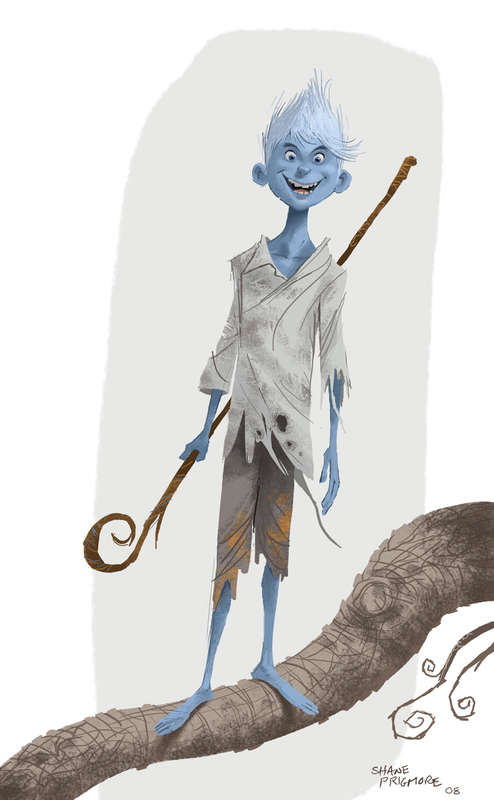 Playing with a Tom Sawyer meets Lost Boy vibe. (The very first image at the top of this post would be included in this category). Emphasizing the fun loving aspect of his character here. -The decision was made to keep Jack young, but a teenager. As our story evolved I very quiickly explored some more ranges and ethnicities (Below). Would he be American, Romanian, Icelandic…etc? 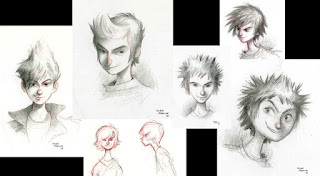 At this point(mid 2008) we started imagining Jack as a more rebelious character so Alex McDowell suggested I even look at Punk legend Sid Vicious for inspiration. We were still exploring style at this point. -In late 2008 there was a request to give Jack a more "current" look. 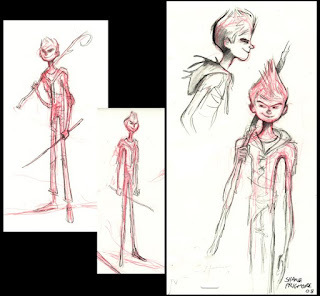 Below are the very first images created of Jack Frost wearing a hooded sweatshirt. The idea was that since Jack has been around for many years, he would find articles of clothing from whatever time period he is living in at the moment and create his own mix match look. Here he is also sporting his more spiky fohawk hairdo for the first time. Still exploring style. By late 2008 the film was greenlit for production, and along with continuing to develop the film, I also began storyboarding on the first pass of the production. 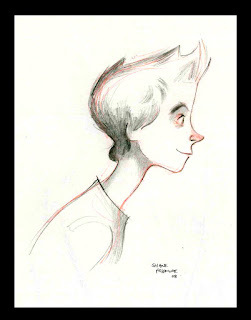 While we were boarding we were also trying to hone all the character’s designs at the same time. A lot of debate durring that process. 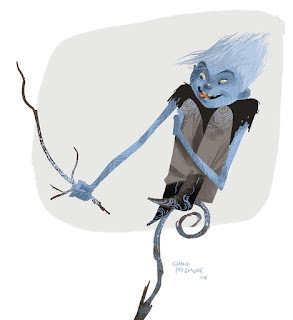 Much more on the development of Jack Frost and the RISE of the GUARDIANS to come! Thanks guys. This was a fun film to help develop. I hope you find these glympses of the process interesting. Lots More on the development of the film to come. your versatility is amazing. soo good all of this is so good!! Really interesting to see the character development. 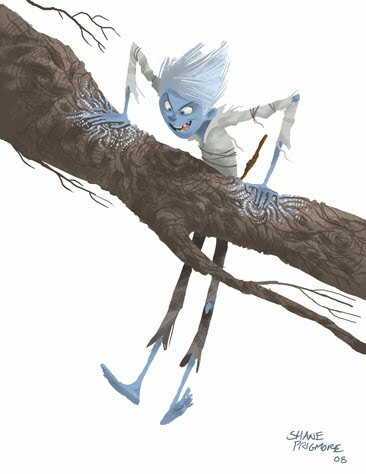 I have to say, I really love how Jack Frost turned out on the big screen. He is super cute and I love his hair style and the contrast of his blue eyes! In fact, my friends and I actually watched the movie mostly because we found him to be very beautiful in the trailer :P Hard to find appealing animated male characters these days... most of them look way too ordinary or weird. Thanks again everyone, and happy Holidays. page of the site is very impressive pleased to visit I found your site on google. good work. keep going on. This is such a best blog where i get all the information. Keep updating us. I like your blog. Thanks for sharing this information. ijin berkunjung..kami akan memperkenalkan produk terbaru kami..semoga bermanfaat dan sukses..
this are really nice pumpkin carving designs. please refer to my designs also. happy new year wallpaper happy new year facebook messages christmas top wishes new year images 2017 christmas quotes for whatsapp christmas coloring pages 2016 let’s have a lovely look of these New Year Card Messages, happy new year messages for friends and then share it now to celebrate this Happy New Year. Friends tis is the main time to do something extraordinary. This heartwarming New Year Messages For Friends And Family. this is the best nba live mobile tips for you have fun. Saint Patrick's Day, or the Feast of Saint Patrick (Irish: Lá Fhéile Pádraig, "the Day of the Festival of Patrick"), is a cultural and religious celebration held on 17 March, the traditional death date of Saint Patrick ( c. AD 385–461), the foremost patron saint of Ireland. That was a nice article on rise of guardians and the picture emphasized the subject matter of the article in addition to creating a clear visual impression. I will apply the same skills while writing my blog articles and content and some of the samples can be read by clicking on Professional Thesis Service Providers. The information you convey is very useful for me as a reader, hopefully you for the future progress and prosper. I'm sorry I saved the link on your blog. القضاء على التسريبات هو من أكثر المشاكل المشتركة الرئيسية في أكثر المنازل. تحديد موقع التسريب هو اهم جزء ، فإنه من الصعب حل المشكلة إذا لم يكن هناك كشف صحيح عن مكان و جود تسرب المياه.